Long long ago, there lived a talented sculptor, who was also a very devout man. He once got a vision of Lord Muruga, asking him to make 3 sculptures of the lord as Shanmugha (6 faced), seated on a peacock, which would be more beautiful than any other idol made so far. Of course, a sculptor needs a patron, and the lord provided him a patron in the form of the king who wanted a beautiful idol for the temple at Sikkal. He wanted a stone idol for the moolavar as well as bronze idol for the Utsavar. The sculptor began his work with a huge block of stone at the village right next to Sikkal. He worked with so much devotion and dedication, that when he was done, it was certainly the most beautiful sculpture of Shanmugha ever made. It was so detailed, that even the veins on the palms of the lord and the on legs of his mount were visible. The whole sculpture stood, not on a base, but on the two spindly legs of the peacock, Muruga’s mount. It held in its mouth, a snake, and the Lord sat on it, 6 faced, holding weapons in all 12 arms. The veins in his hands stood out as he gripped the Vel, his spear. Once the king saw this beautiful piece of work, he became greedy, and desired that this idol, which would be his, would be the most beautiful idol ever. He no longer wanted the sculptor to make the other two statues. He called the sculptor and cut off his thumbs, giving him lots and lots of wealth to compensate for his cruelty. The devout sculptor refused the wealth and departed, leaving all he owned behind where he worked. Since he left his belongings (porul) behind, this place came to be known as ‘Porulvaithacheri’. The idol could never be moved to Sikkal, and remained where it stood, and still stands there today; in a temple few people visit. In due time, another idol was installed at Sikkal. Meanwhile, the sculptor moved to another village, and started work on another idol, but with a slightly smaller stone. Even without his thumbs, he managed to recreate the beauty of the original idol. This one is even more special, since it was made with just 8 fingers. This village thus came to be known by the name ‘Ettukudi’. However, the king soon came to know about this, and he gouged out the eyes of the sculptor. The sculptor did not even give up then, moving to another village, where he worked on another smaller stone, once again recreating the beauty, even without his eyes. When he opened the eyes of the deity, the lord finally blessed him, and gave him back his eyes as well as his thumbs. This is certainly an amazing statue, just as beautiful, just as detailed, the veins standing out, even though it was made without eyes (kann). Hence, this place came to be known as Enkann. 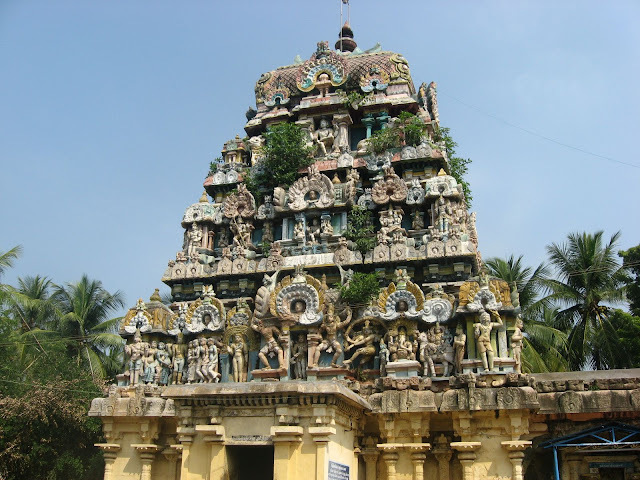 Sikkal, Porulvaithacheri, Ettukudi and Enkann – all these temples are situated around Thiruvarur, and one can easily visit all of them in a day. I would advise all of you to please visit all these temples, and see for yourself the beauty of these idols. Was it the talent of the sculptor or his devotion, or was it the lord working through him? I do not know the answer to these questions, but it impossible to deny the existence of a higher power when you are in the presence of beauty such as this. 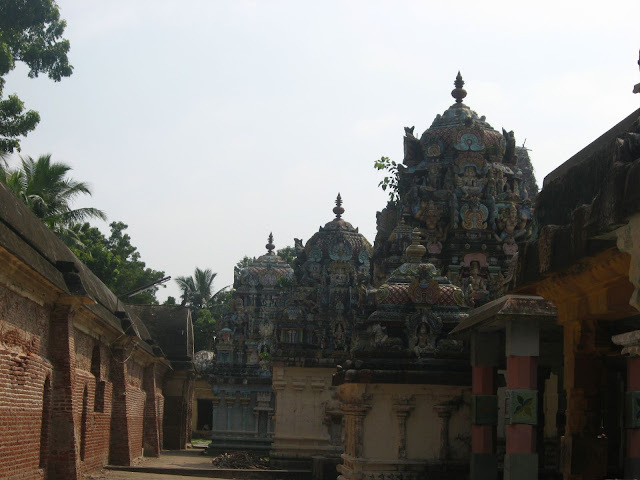 Sikkal is just 5 Kms from Nagapattinam on the road to Thiruvarur. 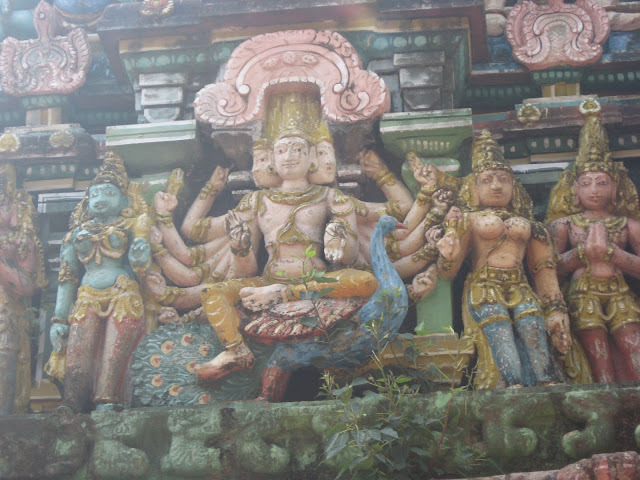 The main deity here is Navaneetheswarar. It is believed that Indra prayed to Shiva here, making a lingam out of butter, and hence the name. 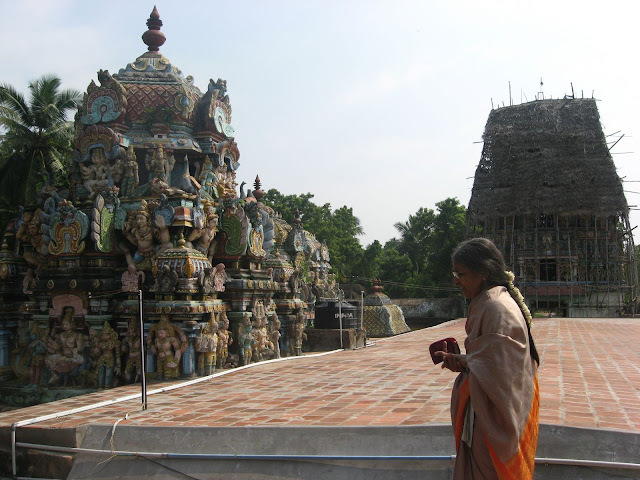 The goddess here is Vel kanni Amman, who is believed to have given Muruga the Vel for his war against Surapadman. The figure of Singaravelan – Muruga with the Vel is the Utsava Moorthy, and it exceptionally beautiful. Every year, during the Skanda Shashti festival, when the lord collects the Vel and enters the sanctum, he sweats, and the walls of the sanctum get covered with the sweat! To begin with, I must thank Outlook Traveller for informing me about this temple. I read about this temple in their book ‘100 Pilgrimage places in India’. Even my mother-in-law was unaware about this temple, and after we visited it, we were absolutely floored. 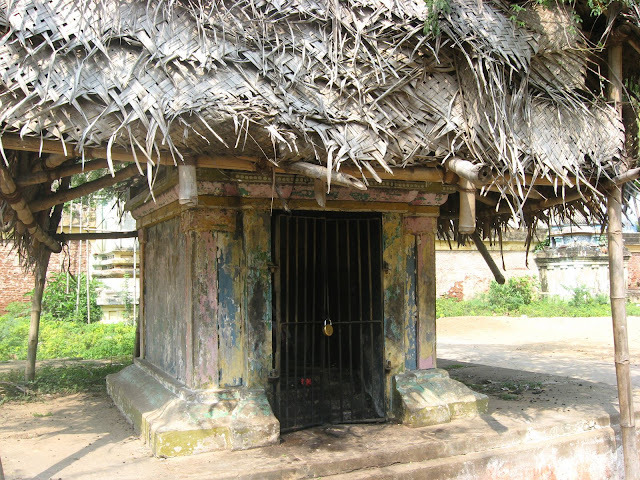 Porulvaithacheri, now called Poravacheri, is just a kilometer before Sikkal, 4 Kms from Nagapattinam. The main deity here is Shiva, but it is the idol of Shanmugha which captures all your attention. It is truly the most beautiful one that I have ever seen. It seems like the peacock will fly away at any moment with its master – the idol is so life-like. 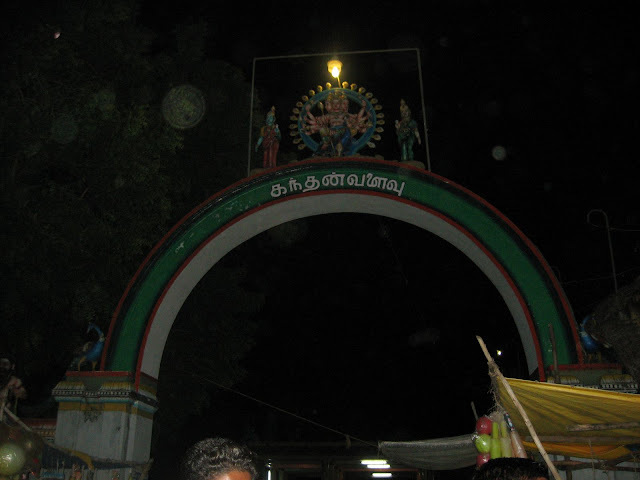 Ettukudi is 11 Kms from Sikkal, on the road towards Thiruthuraipoondi. Here, the beautiful idol of Shanmugha is the main deity, as it rightly deserves. In the light of the oil lamp, as we saw it, it was beautiful, but what was wonderful was the Abhishekam to the deity. As milk flowed over the stone, every single nuance of the lord and his mount stood out. Never have I been as fascinated as I was by that abhishekam. If you want to see it for yourself, plan to visit around 6:15PM, when the abhishekam starts, and be ready to spend at least an hour to see the deity decorated fully. 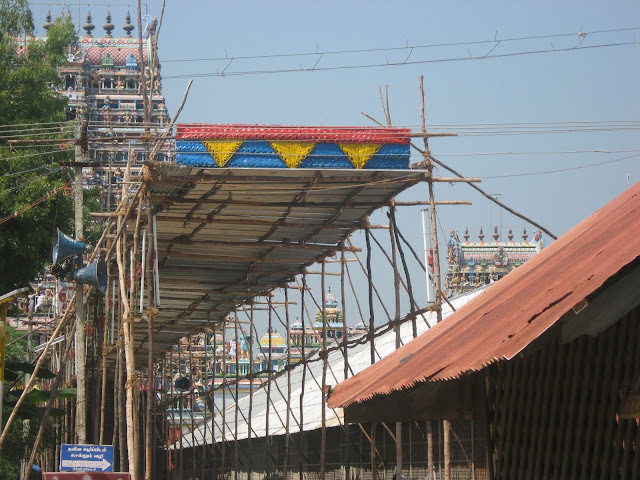 For more detailed information about the Ettukudi Temple, visit the Ettukudi Murugan Website. Enkann is 15 Kms from Ettukudi, and 10 Kms from Thiruvarur towards Thanjavur. Here, the main deity is Brahmapureeswarar and his consort is Periyanayaki. Again, the idol of Shanmugha doesn’t let you take your eyes off it. I kept wondering all the time how the man managed to create this miracle without his eyes! This temple also has the Samadhi of the sculptor who merged with his beloved lord at this place. 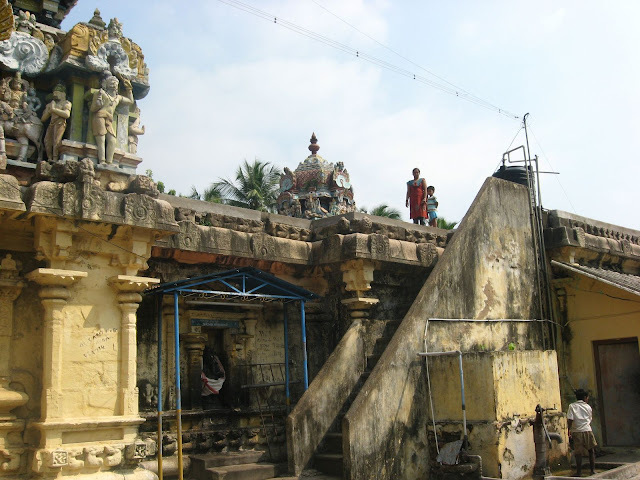 An interesting thing about this temple is a staircase through which one can climb right to the terrace and have a closer look at the gopuram.